This past weekend was a very eventful one. My son turned 11!! It's incredible how quickly each year flies by, and equally shocking to see the little guy growing by leaps and bounds before our very eyes yet seemingly overnight. We were lucky to enjoy a gorgeous weekend - sunshine, low-humidity in the high 80's, with a light breeze - the perfect backdrop for a little birthday barbecue we had for the birthday boy on Saturday. Dad was on the grill and the kids were busy working up an appetite playing and just being kids. This year, I bought a classic ice cream cake for our birthday boy but I made him some fun cupcakes. 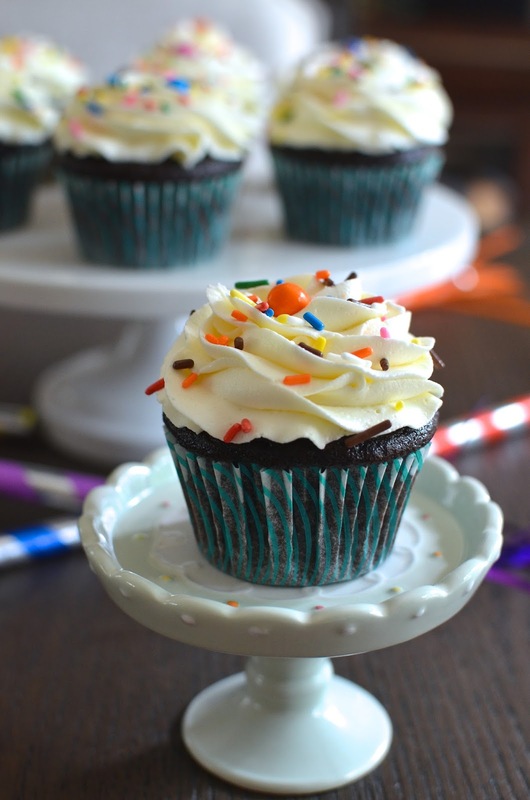 They're chocolate cupcakes with vanilla frosting...but there's a little surprise inside. They're stuffed with some celebratory goodies...in the form of sprinkles, miniature m&m's, and other colorful candies! They're pinata cupcakes! Slice them open and let the colorful treats spill out! They are such fun! When I first saw them a couple of months ago on the Food Network show, The Kitchen, I knew I wanted to make them as a little surprise for my son's upcoming birthday and that's what I did for him and the other kids at the party. The little guy thought they were just regular cupcakes but I gave each child a plastic knife and asked them to slice their little cakes open for a surprise. And seriously, the best reward for this small effort of mine was the smile that came to the birthday boy's face and the look of surprise, and happiness. It was such a great feeling and a wonderful moment. My birthday boy loved the pinata cupcakes and said they were the best thing at the party. I think he was just saying that to be nice but it was lovely how appreciative he was. And I know he did enjoy them because I turned around to slice his ice cream cake and when I looked down again at his plate, his cupcake - including the pinata filling - was all gone. He ate it all! Somehow, I had envisioned the candy and sprinkle filling as more of a decorative element as opposed to for eating. These were such fun and easy to do. I'm really glad I made them and thankful for another year of happy birthday memories. Am I the only person who doesn't/didn't know about Sixlets? Even my husband knew what they were! 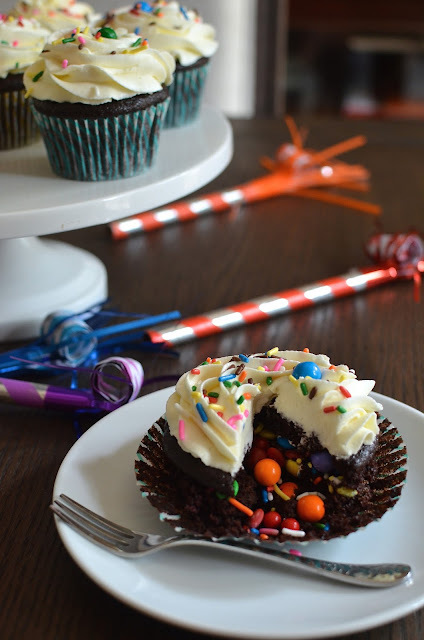 In doing some "research" for these pinata cupcakes and looking for appropriate small-sized candies to stuff into the cupcakes, I started seeing lots of references to them and got my hands on some of those candy-coated chocolate balls to incorporate into the "pinata". How can you help but smile at the bright, cheerful colors! It's so festive; that bowl of candy and sprinkle mix-ins just shouts, party! 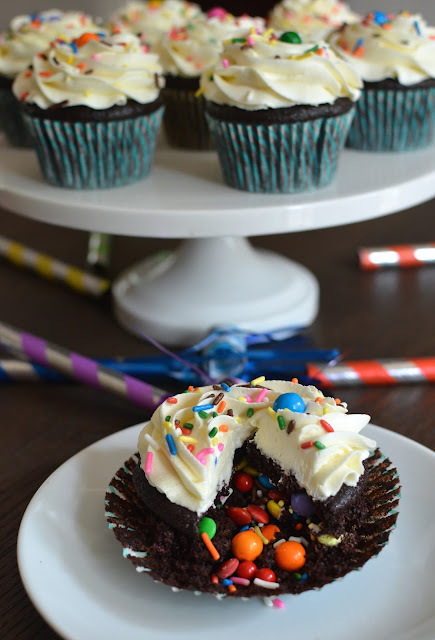 With the pinata cupcake idea in mind, you can really use any flavor and combination of cupcake and frosting you want. To make mine, I decided to lean on recipes I've made before. For the chocolate cupcakes, I went with a very easy, essentially one-bowl, recipe from Martha Stewart (I used them for these owl cupcakes). Not only is the recipe simple, the cake turns out moist but not too fragile so there's some structure to hold the filling. I went out and bought a cupcake corer for the job. You could use a knife and simply cut out an opening. I bought a corer that had a fairly large opening (about 1 1/4 inch in diameter) so that I would be able to make an ample well for the surprise candy filling. I wanted to make sure there was a lot of filling and big impact when the kids sliced them open. Push the cupcake corer down into the cupcake about 2/3 of the way down (so not going all the way to the bottom) and twist away to remove. Carefully remove the core and set it aside. If necessary, use a spoon to clean out the well and then fill the opening with the candy filling you've mixed together. Then, take the cupcake core you removed, trim it down slightly, and place the top back onto the cupcake to cover the candies. The frosting will cover any imperfections. I used a simple fluffy vanilla frosting recipe, also from Martha Stewart (I once used it for a batch of Ninjago cupcakes). My son and husband were big fans of the frosting on these cupcakes. I used a 1M tip to pipe on the frosting. You could use another kind of star tip or a plain round tip. If you don't want to pipe the frosting, just spread it on the cupcake using a small offset spatula. Just make sure to add some colorful sprinkles on top to finish. I made the cupcakes the day before the party. As much as I love nonpareils, I avoided them as a topping because they tend to melt once covered. The regular sprinkles/jimmies work well and stay intact, without any melting or color leaching, so they were in perfect shape the next day. They were ready for the party! These were so much fun and I'm so, so happy the birthday boy loved them! A giant Happy Birthday to my little guy, who I know is no longer literally "little", and hasn't been for a couple of years now! I just can't seem to let go of the habit of calling him that. Here's to a great year ahead...and may each year be filled with happy surprises waiting to be revealed! In addition to a busy and celebratory Saturday, we also had a gorgeous day on Father's day! It was quite a lot more relaxing but also filled with good family time and lots of treats. What a weekend! For the "surprise" candy filling: Mix together about 1 scant cup total of sprinkles, nonpareils, miniature m&m's, and other small candies such as Sixlets. Make cupcakes: Preheat oven to 350 degrees. Line standard muffin tins with 9 paper liners. Sift the flour, cocoa powder, sugar, baking soda, baking powder, and salt in the bowl of a stand mixer. Whisk egg, warm water, buttermilk, oil and vanilla together. Add wet ingredients into the dry and beat in the stand mixer until combined. Divide batter into the 9 lined baking cups (they will be about 3/4 of the way full). Bake for about 17-20 minutes, until a cake tester inserted into the center comes out clean. Carefully remove cupcakes to a wire rack to cool. Make frosting: Cream the butter on medium-high speed for about 2 minutes, until pale and creamy. On medium speed, add the confectioners' sugar, about 1/2 cup at a time, beating well after each addition and scraping the sides and bottom of the bowl as needed. After every two additions, raise the speed to high and beat for about 10 seconds to aerate the frosting, then return it to medium speed. The frosting should look very pale and fluffy. Add vanilla extract and beat until frosting is very smooth. Transfer frosting into a pastry bag fitted with a star or round tip, if desired. 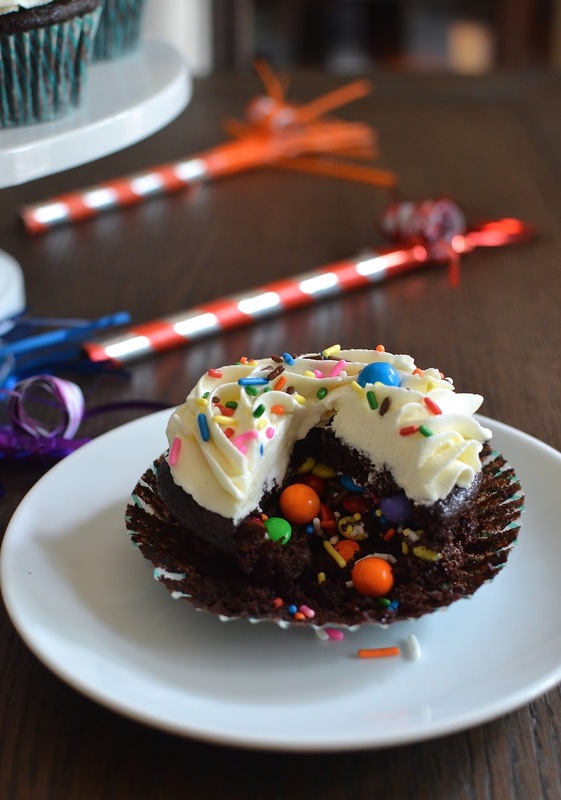 Assemble pinata cupcakes: Using a cupcake corer (I used a wide one with about a 1 1/4-inch diameter; you could also use a round cutter or knife), make a well in the center of the cupcake. Insert the corer about 2/3 of the way down into the cupcake (don't go all the way to the bottom). Twist the corer and cupcake in opposite directions to remove. Carefully remove the cupcake core and set it aside. Use a spoon to clean out the well of the cupcake, if necessary. Then fill the opening about 2/3 way full with the candy mixture. Trim the reserved cupcake core down slightly, then place it back on top of the cupcake to cover the well. Repeat with all the cupcakes and then frost with the vanilla frosting. 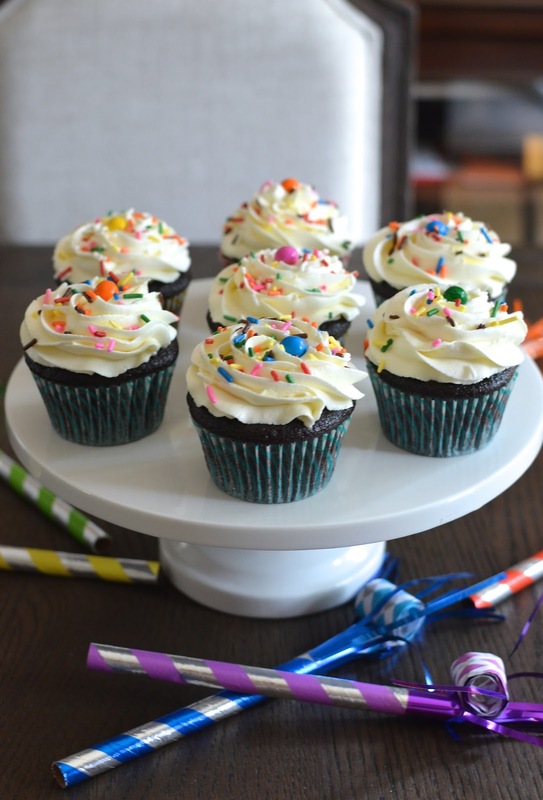 Add some sprinkles on top of the frosting and set on a cake stand - ready to surprise someone! What a fantastic idea! They look so fun! Thank you, Bobbi! Time cannot be slowed, that's for sure. You can only try to enjoy it. Hope all is well. Love this idea! They look great and so colourful too. What a great idea for a kids' party!! I LOVE Sixlets (they've long been my go-to, but you don't see them around much anymore) and I love The Kitchen, too! I know realize they have them at party stores and craft stores - were they always this popular?! Thank you, Wendy. He was surprised and so appreciative. Birthdays are the best - with the kids, it really reminds you to stop and take time to celebrate them and their very existence. Lots of M&M!! These cupcakes look so colourful and yum! And Happy Birthday to your boy, Monica! Yes, plenty of m&m's. I love looking at them and eating them, of course. And thank you for the birthday wishes. Happy birthday to your son! This idea is so fun- who doesn't love cake AND a surprise? WOW! This dessert is insane! I'm totally going to bake it! Very easy and fun little surprise. Thank you! Oh my goodness, these cupcakes look adorable! I would love to make for friend's my daughter for her birthday. It's such a fun idea and really not hard to do at all. Hope you try it. Thank you! Happy birthday to your son! I LOVE the sound of these cupcakes! So fun. I am really looking forward to being able to enjoy a muffin soon. These look and tasty. Thanks - it was a fun birthday! What a very creative idea! I thought so when I first saw it. I love easy to execute ideas that I never thought of but wish I did! Aaaw Happy Happy Birthday to your lil guy, Monica!! SO much FUN!! I LOVE the pinata cupcakes and I can see why they were such a hit! I would have loved these, you are the best mom! :) The sprinkles, sixlets and M&M's are just the perfect way to get anyone to light up. So glad the weather was gorgeous too! Sounds like the best day! This was easy enough for me to do, Kelly! He loved it and I had fun making them! Hope you are enjoying the summer so far. I am so making these cupcakes, my kids would love them so!!! Yes - kids will get a giggle out of it! Thanks, Juliana. I had a little baby pinata at the party, too. Funny stuff. What a fun idea to make cupcakes like pinatas! I love it! Happy happy birthday to your son Monica!! He must be so happy to see these amazing cupcakes!! We all had fun...thanks for the birthday wishes! Hi Monica, 11 wow! they grow so fast. Happy Birthday to your son. I can see why he loved the cupcakes so, really clever!! They do grow up so fast and these last few years have sped up even more if that's at all possible! : ) Things are finally starting to slow down a bit...ready to enjoy a good summer. Happy belated birthday to your son! I bet he had a great day, especially with these cupcakes! Whenever it hits me, I realize I'm really old now! : ) No "pre-teen", please! Oh boy...just the thought has me a bit nauseous! haha. These cupcakes were fun and easier than I thought (because I always figure things are more complicated than it looks). Hope your little one has a great birthday! Thanks so much, Sonali! I bet you are baking up a storm for your family and friends; they are so lucky! These cupcakes are such an easy way to have a little joke and fun with the little ones. : ) I wouldn't mind them for *my* bday either! Happy birthday to your son! I hope he'll get back in the kitchen with you soon and do another guest post :) The years fly by and how wonderful you can document some of his growing years on this blog. Love the cupcakes and the surprise in side. Hope you have another wonderful weather weekend! Thanks so much, Tricia. Weather is still great...hope the newest member of your family has arrived!! These cupcakes look amazing!! I have always wanted to make pinata cupcakes. Need to try this sometime. How cute! I can certainly see why the birthday boy enjoyed them. My congratulations to him. Who knew about a cupcake corer let alone Sixlets…I can see I'm really behind in cupcake making. Thank you so much! I'm glad they turned out pretty well. I am always a little nervous about making cupcakes.